AUGUSTA, Ga. (AP) — The Masters should have been the first major Rory McIlroy won. Now it is the only one he is missing. Augusta National was thought to be the domain of Tiger Woods when he won four green jackets before turning 30. Now he is 43, with eight surgeries behind him, so far removed from his last Masters victory that the club has changed chairmen twice since he last won 14 years ago. 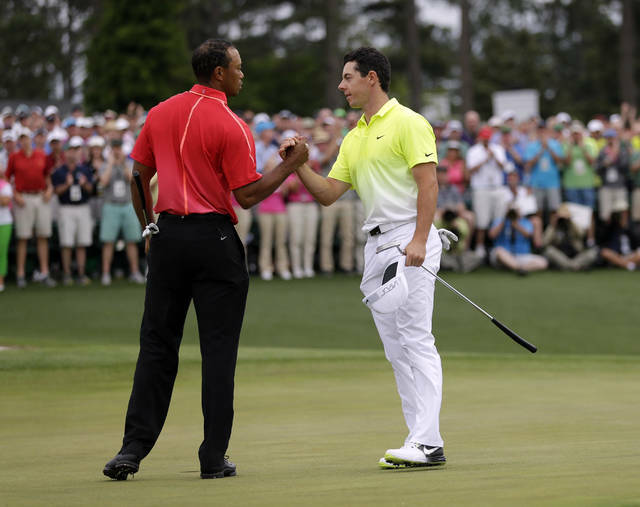 McIlroy and Woods are the central figures at the 83rd Masters, which starts April 11. They share the stage with a cast of characters that gets deeper and stronger every year, so tough that 23 of the last 25 major champions were among the top 25 in the world ranking. One is looking to join the most elite group in golf by capturing the final leg of the career Grand Slam. The other is looking to recapture glory on a course where his red shirt was blazing among the azaleas, dogwoods and all the colors of springtime in Augusta. Woods has always had a hold on the Masters, so much that his Sunday shirt packed as much interest as the green jacket. To see him two years ago walk gingerly to the Masters Club dinner for past champions was to wonder if he would ever shine at Augusta, much less play. It was only a few weeks later that Woods had a fourth surgery on his back to fuse the lower spine. He not only returned, Woods capped his remarkable comeback by winning in Georgia last year for his 80th career victory on the PGA Tour. But it was at East Lake in late September, not at Augusta National the second week in April. Is his comeback complete without a major? Woods last year was still learning what his fused back was capable of doing. 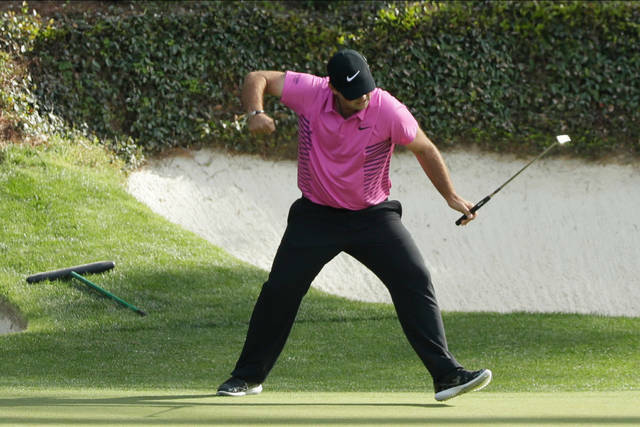 He was coming off two close calls in Florida, but he didn’t break par at the Masters until the final day, when it was much too late. Now he is building, and while his results in five tournaments this year have not been anything special, Woods has been gearing for this week. His last two majors were telling because he was in the hunt at both of them until the final hour. He briefly had the lead at Carnoustie in the British Open. He chased Brooks Koepka all the way to the finish line in the PGA Championship. McIlroy had reason to think he would be allowed upstairs in the champions’ locker room by now. It was in 2011 when he had a four-shot lead, only to throw it away with a tee shot behind the cabins, a four-putt from 12 feet, a wild drive along the azaleas and an 80 on his scorecard. He responded by winning four of the next 15 majors, before being slowed by a few nagging injuries. This will be his fifth shot at the career Grand Slam, and he is getting closer. McIlroy played in the final group last year with Patrick Reed, missing a short eagle putt on the second hole that set the tone for his day. Already this year, he has not finished out of the top 10 in all seven of his tournaments, including a victory at The Players Championship against the best field in golf. Is he excited? Hard to tell. McIlroy has spent the last year reading books on life and success, working more on his attitude than his golf game. He is determined not to let the sport define his success. And it appears to be paying off. Las Vegas has installed him as the favorite at the Masters. This figures to be his biggest test. So powerful is the allure of Augusta National and the exclusivity of the club and its list of winners that players have been haunted over the years at being left out, whether it was Greg Norman or Tom Weiskopf, David Duval or Tom Kite. That’s just the mystique. Equally tough will be the players Woods and McIlroy are trying to beat. McIlroy at No. 3 is among five players who are vying for No. 1 in the world — Justin Rose, Dustin Johnson, Brooks Koepka and Justin Thomas are the others. All of them have reached the top of the ranking before, all of them having won a major or more. It has never been this crowded at the top since the ranking began in 1986. Missing from that list, and perhaps the most intriguing player at the Masters besides Woods and McIlroy, is Jordan Spieth. No one has performed as well at Augusta as Spieth since his debut five years ago — two runner-up finishes, a wire-to-wire victory, in the hunt on Sunday every year and ending the day atop the leaderboard eight times out of 20 rounds. But he is in the worst slump of his young career, winless since the 2017 British Open, no performance in the top 20 this year. He says his game is close. The Masters might be the ultimate measure of how close — or far — he really is. That is also true for Woods, McIlroy and everyone else. Three months into the year, six months into the PGA Tour season, golf doesn’t feel as though it really starts until Jack Nicklaus and Gary Player hit the honorary tee shot, until “Fore, please” is heard on the first tee as players are introduced, and until that first big cheer makes fans wonder where it came from and what it was for.